At the moment the ‘Rickyard’ is a rather wind swept space on the edge of the new East Shaftesbury Persimmon Homes development; a square waiting for its houses and residents to arrive and create a community. 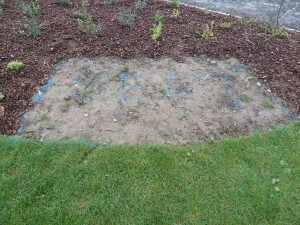 The only sign of what’s to come is the word ‘seat’ is optimistically sprayed on some earth surrounded by new planting. Shaftesbury is a beautiful town, a gem sitting high in the north Dorset landscape, full of history, the bustle of trade and colourful individuals. All this new housing could be seen as an imposition, a bit of an ‘interloper’. Can art help ease this transition – make connections between old and new development, create a cohesive link between the ‘Common Places’ project we have been involved with in the centre of town and the completely new community half a mile to the East? Well Adam Zombory Moldovan from ZMMA and I believe so. 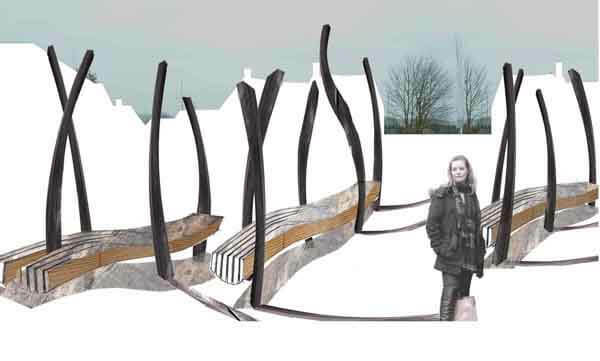 Our ambition for the various public and private schemes we are working on is that they do just that, make links in both a physical and aesthetic way, linking future to past and past to present. We’d love public art to play a role in the town’s everyday life, helping guide people around, tell stories, challenge and at its most mundane provide places to sit, meet, trade and celebrate. Beyond that it could also bring an entirely new audience to Shaftesbury, those who come specifically because they love public art: I’m imagining a town celebrated for its forward thinking and cohesive approach to public art, some by Adam & I as a partnership, but also works by many others. New ideas making the place dynamic and exciting. They wouldn’t loose the visitors that come because the place is historic and achingly pretty. They may loose a few that come because of the ‘Hovis’ connection – although I suspect half of them are traveling around North Yorkshire trying to find the place. A town can not live on bread alone. Back to the ‘Rickyard’ which will be the first site in Shaftesbury to have something completed, hopefully in late summer 2012… The concept is to link the development to the landscape around it, bringing some of that into the bricks, tarmac and planting schemes which always look so harsh before they mellow and mature. 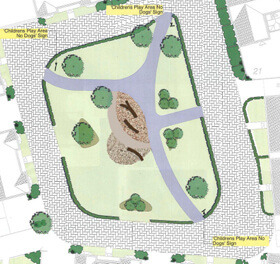 The small green where the piece will be located will be surrounded by houses – eventually. A footpath runs through the site linking the landscapes around Charlton Down and Melbury Hill to the town. This will take you right through our ‘interventions’. 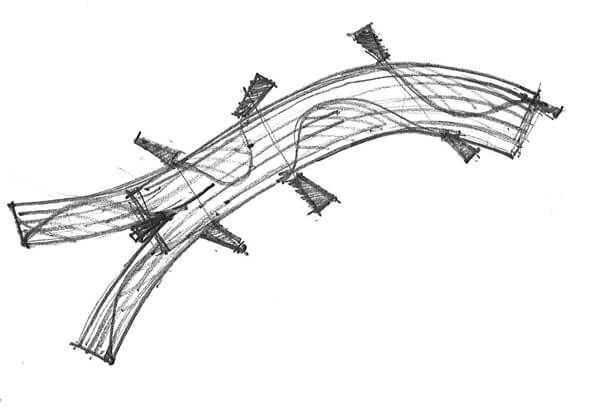 The installation consists of vertically sliced oak logs which are selected for their curvy character and form. These are suspended above the ground by split scorched timber masts. Needless to say they do form seats, but I’m guessing they will be climbed on by kids and have all sorts of other uses and connotations. 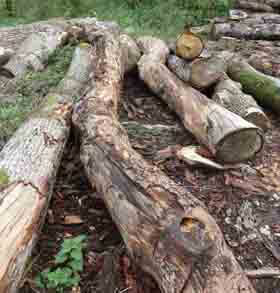 There will be a contrast between the organic log form and the much more finished ‘furniture like’ top surface. The texture and colour of the masts will also contrast with the bulk of the log. It’s a familiar sight to me, like the stacks of timber I’ll search through in a timber yard when selecting for a furniture commission. These are cut vertically rather horizontally though, and the cuts will follow the natural curve of the tree, creating some very exciting forms. Next up is the more substantial ‘Mampitts Square’ a central public space within the Persimmon development where buses stop, people shops, park and live. Lots of potential for seating and public art work. Keep watching this space.